Gary finally pulled out the old time machine. For those of you who don't know, his time machine is called the Time Trekker. When the Prehistoric Party comes this machine will be our doorway to an old world. *Side Note* Don't try stepping on the "Gary Help!" message because you can't! I stood there for 5 minutes thinking my mouse was broken when I clicked to walk on the words. I know you're eager to enter the machine so let's take a look inside. Looks like we can't go into the past just yet. Gary is working on getting the Time Trekker up and running. He says to come back next week on January 23. 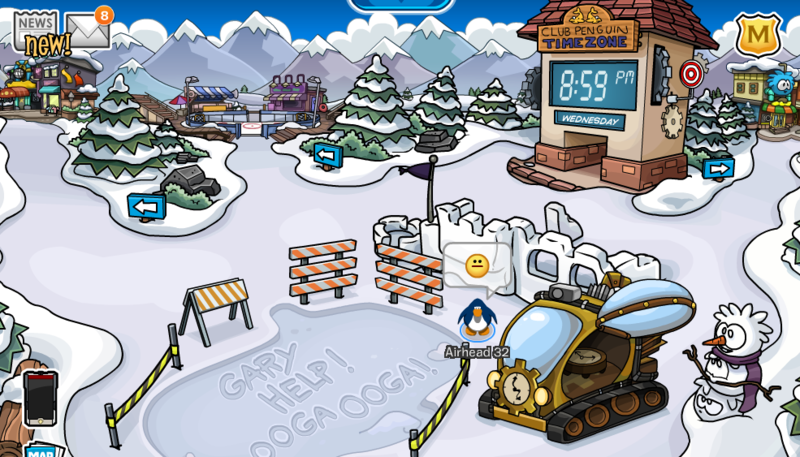 We have to help Garugg The Ugg Ugg with the Dino Puffles. I guess we know what we're going to be doing during the Prehistoric Party, and that is saving Dino Puffles.